I have had the opportunity to make several trips along the Blue Ridge Parkway, in the vicinity of Devils Courthouse and Black Balsam this month. The first was on May 7 with Birding for the Arts. Then I had a private birding tour on May 12 and I was up Saturday and Sunday this past weekend doing bird point surveys for the U.S. Forest Service. Birding was, of course, the primary objective of these trips and the birds didn’t disappoint. However, we beat most of the migrants up to Black Balsam on the May 7, Birding for the Arts trip. I believe common yellowthroat was the only migrant we turned up at that site. Everyone had made it back by this past weekend though. I had alder and least flycatchers, veery and hermit thrush, gray catbird, chestnut-sided and Canada warblers had joined the common yellowthroats, northern bobwhite was present and I was somewhat surprised to find brown thrashers at one of the sites up on a bald along the Art Loeb Trail. The Manual of the Vascular Flora of the Carolinas notes that Rhododendron vaseyi is an interesting species because its 5 to 7 stamens are, “…intermediate between the Rhododendrons with 10 stamens and the Azaleas with 5.” It’s also distinguished from other native azaleas by its short (2-5 mm) corolla tubes. Most native azaleas have long narrow corollas reminiscent of honeysuckle. 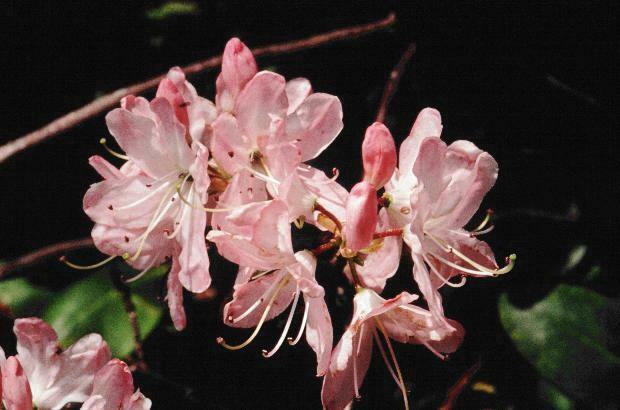 George Vasey, first director of the U.S. National Herbarium, discovered Pinkshell azalea in 1878. And while the majority of pinkshells are, indeed, pink, blossoms can range from almost pure white to deep purplish-pink. In early May, not many pinkshells were in bloom, but the buds (which may actually be darker pink) were glowing from the rock ledges along the shoulder of the Parkway, where the shrubs cling. By mid May the buds began to burst bathing the Parkway in pastel pink. They are probably beginning to wane now but there should be good viewing this weekend. You begin to pick them up as you pass the Richland Balsam Overlook, headed towards Asheville. They are common all the way to Mt. Pisgah. Going south on the Parkway from Waynesville, you can find pinkshells just before and just beyond Waterrock Knob. And as I mentioned earlier, they can be found on Whitesides. Grandfather Mountain claims to be home to the world’s largest population and I’m sure there are other pockets, at high elevation, along the Blue Ridge Parkway and in other locales. You owe it to yourself to keep an eye out for this shrub – it is, indeed, pretty in pink.